Region Guinea-Bissau. Unten finden Sie eine automatische Übersetzung ins Deutsche. Unten finden Sie eine automatische Übersetzung ins Deutsche. Quality MNH. 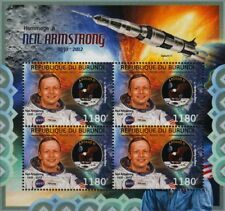 Raum-Wasserstoffprojekts Yuri Gagarin Neil Armstrong Alan Shepard Malediven MNH-Stempel-set. Unten finden Sie eine automatische Übersetzung ins Deutsche. Quality Mint Never Hinged/MNH. Biete wie abgebildet, rares Blockpaar, wovon einer mit Ueberdruck UNICEF in Rot zum Thema Raumfahrt, Armstrong, Eisenhower und Apollo 11. Handle und sammle schon seit über 20 Jahren. -- und innerhalb Schweiz = SFr 2. 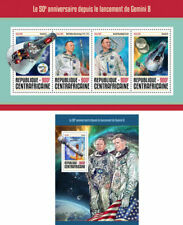 Mint, never hinged Neil Armstrong/moon landing/space travel stamp sheetlet. 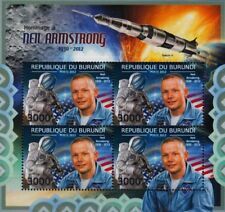 NEIL ARMSTRONG Stamp Sheet. Issued by Burundi in 2012. 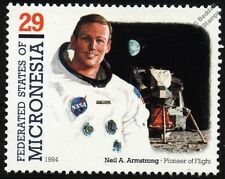 Micronesia - Pioneers of Flight Aircraft Stamp. 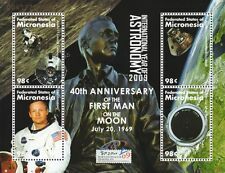 40th Anniversary of First Man on the Moon Stamp Sheet. 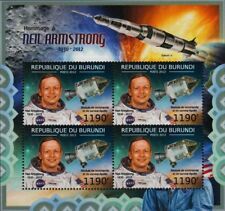 Astronauts Stamp Sheet. Issued by Comoros Islands in 2008. 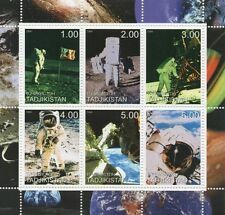 1969-1999 APOLLO XI Moon Landing Stamp Sheet. JOHN F.KENNEDY Space Stamp Sheet. (Congo 2018 NASA - 60th Anniversary - Mint Never Hinged (MNH). 2x Sheets with 1 value each (2x 1v S/S): 2000F x 2. ==================================================. 3) Select each item and 'Add to Basket'. Our invoices are prepared electronically and are acceptable unsigned. # Yvert & Tellier:1684-1687 # Michel:2680-2683 # Scott:1154 Item in mint MNH excellent condition with excellent gum. We ship only by REGISTERED (Signed for) mail, well packed and protected. We charge only actual cost of the Post. Shipping cost of this item: $6.25 Priority Registered Mail Worldwide. We do combine shipping cost of multiple items - for $6.25 we can ship 2 to 5 sheets (depending of size of the sheets purchased). If you buy more (up to 50 sheets), then combined shipping cost will be $7.00 worldwide by Priority Registered Mail - we will send you a combined eBay invoice. Please note: we CAN NOT combine invoices for items purchased from different ebay sites. For example if you buy one item from ebay.com and another from ebay.ca or ebay.it or ebay.nl, then we can not send one combined invoice for them. Item in mint MNH excellent condition, excellent gum, beautiful. We ship only by REGISTERED (Signed for) mail, well packed and protected. We charge only actual cost of the Post. Shipping cost of this item: $6.25 Priority Registered Mail Worldwide. We do combine shipping cost of multiple items - for $6.25 we can ship 2 to 5 sheets (depending of size of the sheets purchased). If you buy more (up to 50 sheets), then combined shipping cost will be $7.00 worldwide by Priority Registered Mail - we will send you a combined eBay invoice. Please note: we CAN NOT combine invoices for items purchased from different ebay sites. For example if you buy one item from ebay.com and another from ebay.ca or ebay.it or ebay.nl, then we can not send one combined invoice for them. If you buy one item only, then you can pay the automatic invoice ebay sends out. # Yvert & Tellier:260 # Michel:2684 / Bl.260 # Scott:1173 Item in mint MNH excellent condition with excellent gum. We ship only by REGISTERED (Signed for) mail, well packed and protected. We charge only actual cost of the Post. Shipping cost of this item: $6.25 Priority Registered Mail Worldwide. We do combine shipping cost of multiple items - for $6.25 we can ship 2 to 5 sheets (depending of size of the sheets purchased). If you buy more (up to 50 sheets), then combined shipping cost will be $7.00 worldwide by Priority Registered Mail - we will send you a combined eBay invoice. Please note: we CAN NOT combine invoices for items purchased from different ebay sites. For example if you buy one item from ebay.com and another from ebay.ca or ebay.it or ebay.nl, then we can not send one combined invoice for them. : neuf sans charnière ( ) : regommé : avec charnière ou trace(s) O : Oblitéré. DEF : DEFectueux : timbre présentant des défauts visibles. B/TB : Beau/Très Beau : timbre de bonne qualité présentant un petit défaut (petit mince, pli, etc). Apollo XI Moon Landing Stamp Sheet. Issued by Union Island, Grenadines of St Vincent in 2009. (Congo 2018 NASA - 60th Anniversary - Mint Never Hinged (MNH). Sheetlet with 2 values (2v M/S): 2000F. 3) Select each item and 'Add to Basket'. 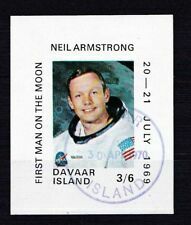 Item in mint MNH excellent condition, excellent gum. We ship only by REGISTERED (Signed for) mail, well packed and protected. We charge only actual cost of the Post. Shipping cost of this item: $6.25 Priority Registered Mail Worldwide. We do combine shipping cost of multiple items - for $6.25 we can ship 2 to 5 sheets (depending of size of the sheets purchased). If you buy more (up to 50 sheets), then combined shipping cost will be $7.00 worldwide by Priority Registered Mail - we will send you a combined eBay invoice. Please note: we CAN NOT combine invoices for items purchased from different ebay sites. For example if you buy one item from ebay.com and another from ebay.ca or ebay.it or ebay.nl, then we can not send one combined invoice for them. If you buy one item only, then you can pay the automatic invoice ebay sends out.